Stickyboard 2 van Qrayon, LLC is een iPad app met iOS versie 7.0 of hoger, geschikt bevonden voor gebruikers met leeftijden vanaf 4 jaar. Nothing beats a whiteboard and sticky-notes for capturing lots of loose information and seeing the big picture. 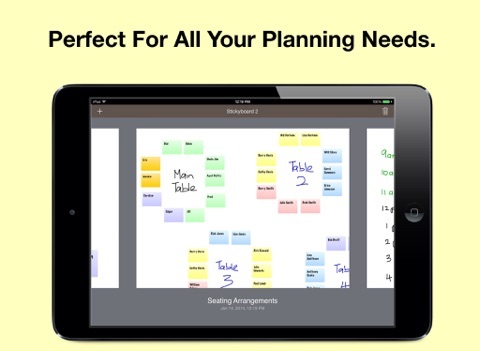 Stickyboard takes that flexibility and adds the convenience and power of your iPad. Don't worry about losing notes after a meeting again. It's much easier to carry around, and a lot friendlier for the environment. Use any color coding system you like. 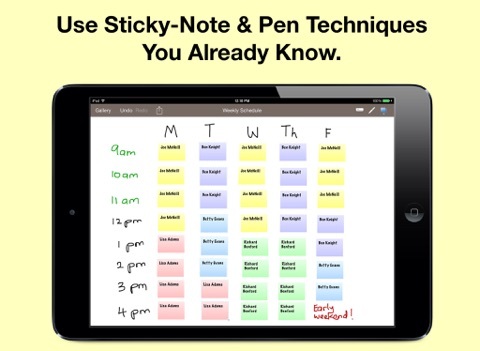 Effortlessly move and group your notes - unlike paper sticky notes, they don't fall off after too may moves. Think in the way that works best for you, and for the problem at hand. The most exciting feature of Stickyboard 2 is something we call Magic Arrange. One of the biggest pains of working with lots of sticky notes is having to arrange and rearrange them. Wouldn’t it be nice if you could just wave your hands and have them neatly arrange themselves? Well, with the magic of the iPad and Stickyboard 2, now you can! Just select a bunch of notes, then swipe with 3 fingers to instantly arrange them into neat piles, or fan them out into a grid, columns, or rows. 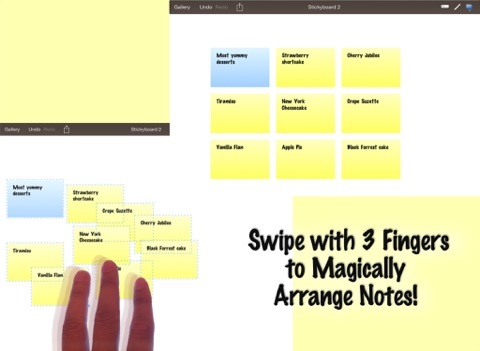 This is going to change the way you work with sticky notes, and you are never going to look at paper notes the same way again! - The Board Gallery: Easily manage multiple boards and quickly switch between them with the gallery view. - Smoother Ink: The ink system in Stickyboard 2 is much improved over its predecessor. It supports multiple colors with stutter-free drawing. - Unlimited undo/redo and Copy/Paste: Undo/redo works with notes and ink, just as you would expect. Tap on selected notes to copy/cut them, even to other boards. Working with large amounts of information is easy with Stickyboard 2. - Email boards as PDF or just text: Whole boards can be easily emailed as PDF files, or opt to just send the text contents instead - very handy for using Stickyboard 2 as an outlining tool. - Lasso Select: Simply run your finger around or through a group of notes to select them. This allows for much more precision than rectangular selection methods, and feels more intuitive on a multi-touch display. ▸ Stickyboard 2 sports an elegant and intuitive interface. Double-tap to add a note. Select and drag notes around with your finger. ▸ You have a large, zoomable board to capture all your ideas. Zoom by pinching, and pan with 2 fingers. ▸ It's easy to rearrange ideas, capture their relationships, and discover important patterns. ▸ Use four standard colors (yellow, blue, pink, and green), plus 2 special ones (lavender and sunrise). ▸ Draw free-form with the marker tool. Write, outline, and sketch around your notes. ▸ Stickyboard 2 is infinitely flexible. Use your favorite real-world sticky-note and whiteboarding techniques. Best regards from the Stickyboard team at Qrayon. 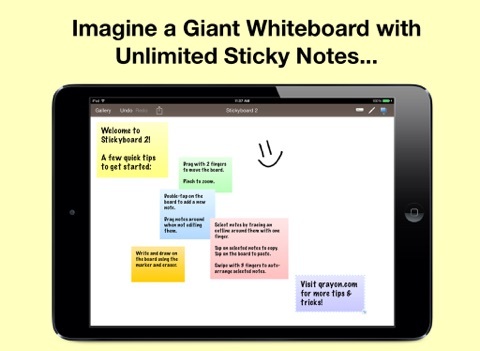 Informatie voor Stickyboard 2 is het laatst vergeleken op 21 apr. om 13:16. Aankopen verlopen via iTunes, controleer daar altijd de meest actuele prijs, compatibiliteit en andere informatie. Je hebt een actieve iTunes account nodig om apps aan te schaffen. Fixed a bug where Export as Text would sometimes not appear. Really awesome app! Just gives you a giant whiteboard and freedom to fill it up. love it! Resume Star: Pro CV Maker and Resume Designer with PDF Output to Help You Score that Job Interview and Advance your CareerUniverseel · Gratis! Inkflow Visual NotebookUniverseel · Gratis! Stickyboard 2 Free Edition: Sticky Notes on a Whiteboard to Brainstorm, Mindmap, Plan, and OrganizeiPad · Gratis!